You know, in the United states today very few criminal cases go unsolved even if it takes months or years to be fully investigated there will eventually be a results but to those unsolved ones what do you think happen to them? Simple, the bureau suspends them or permanently shuts down all investigations or evidence concerning them. They turn to mysteries without reasons or solutions. In the aviation history of air piracy in the United States, only one is still unsolved till today: The hijacking of Boeing 727 by the mystery man D.b Cooper in Airspcace. November 24, 1971 a man bought an airline ticket for flight 305 going to Seattle using the alias Dan Cooper but was later changed to D.B Cooper because of media miscommunication. He took the seat 18c, 18e or 15d not specified as to several accounts by the passengers, neatly and smartly dressed. Shortly after take-off he handed the flight attendant Florence schaffner a note which she ignored thinking it was just a note from a lonely man seeking attention, he leaned over to the attendant and said "Miss you'd better look at that note. I have a bomb". Florence the attendant still thought he was bluffing and asked him to show her the bomb, he opened the case a little enough for her to see the bomb after that, he made three demands: $200,000 in negotiable American currency, four parachute (two primary and two reserves) and a stand-by fuel truck in Seattle ready to refuel the plane upon arrival. Florence schaffner and the passenger recall D.b cooper been calm, polite and not nervous. Some said he was nice and not nasty or cruel he even paid his drinking tab and offered to give the attendant the change. 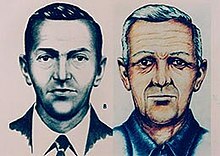 After arriving in Seattle for refuel, D.B Cooper was informed that his demands were ready he instructed the pilot to taxi the plane to an isolated area of the tarmac. There, the Northwest Orient's Seattle operation manager AI Lee approached the plane in street clothes so that D.B Copper won't mistake his airline uniform for a police uniform. He then gave the demanded items to another flight attendant Mucklow, through the aft stairs when the delivery was complete. D.b Cooper ordered all the passengers, schaffner and the senior flight attendant Alice to leave the plane. Before the take-off he outlined his flight plan to the crew with only five people aboard now. 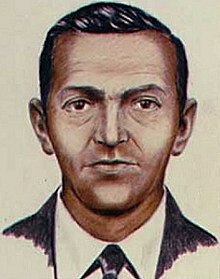 In flight, D.b Cooper told the remaining flight attendant Mucklow, to join the others in the cockpit as he ties something around his waist obviously the parachute after a while the crew noticed a change of air pressure indicating that the aft doors was open that was the time he jumped off in middle of a storm. Ballsy!! Upon landing, the aft door was still open when pilots Scott and Rataczak landed the 727 at Reno Airport with law enforcing bureaus surrounding the plane it was obvious D.b cooper was long gone. In 1980, two packs of 100 twenty dollar bills and a third pack of 90 pieces was found by an eight years old boy Brian Ingram on a family trip with his family. It was later divided between the Ingram family (which they auctioned fifteen of them in 2008 for $37,000) and the Northwest Orient insurer while the FBI retained fourteen as evidence. After few investigations, the bureau found out the suspect's alias D. Cooper was actually from a Belgian Comic books about a fictional hero Dan Cooper a royal Canadian Air force test pilot who had embarked on so many adventures along the series even parachuting. Till today D.B Cooper's real name, his whereabouts, his background, even his actual real face apart from descriptions from the passengers is still unknown till this day. So people what do you make of this?